It's all about whimsy, art and Halloween! 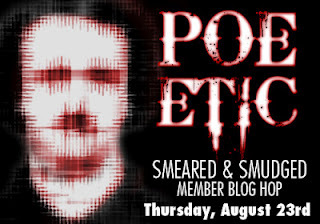 This month the Smeared and Smudged Forum is celebrating everything Edgar Allen Poe, and our August blog hop is ex-Poe-nentially fabulous!. 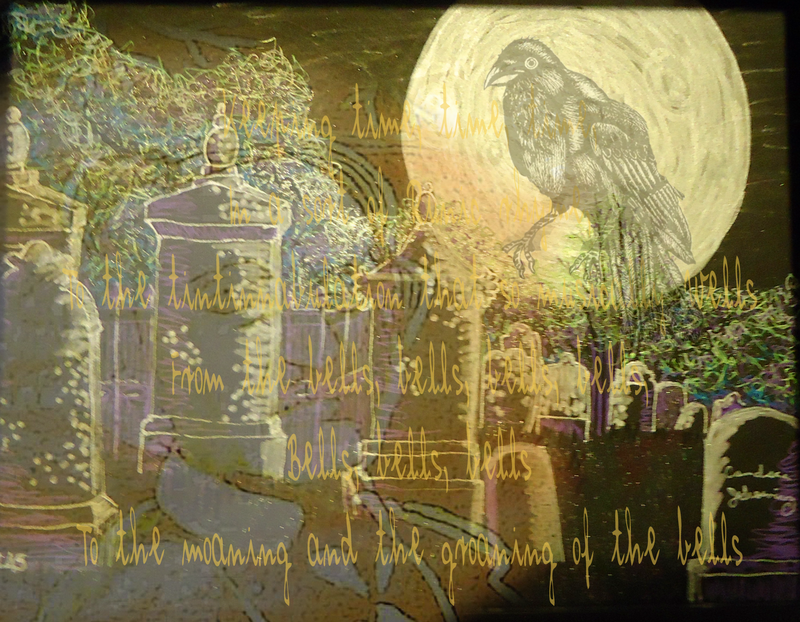 The challenge was to create a piece inspired by one of Poe's poems. What a world of merriment their melody foretells! In the icy air of night! From the jingling and the tinkling of the bells. What a world of happiness their harmony foretells! What a gush of euphony voluminously wells! 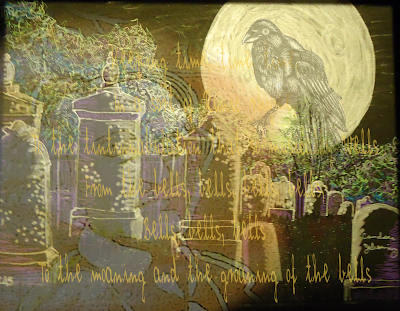 To the rhyming and the chiming of the bells! Hope everything is okay w/ you? Yep! I'm a bit behind in my work, but I'll get on schedule so I can join in the fun! Let us know when you get caught up with your work. We'd love to see your piece. I'm glad all is well! Candace, your piece is hauntingly beautiful! i love the layers you've created and the imagery is fabulous! Totally worth the wait! Wonderful picture. Love the look. Love Edgar. Welcome to my blog! It's all about art, whimsy and Halloween! My first memories of Halloween involve my dad making a spooky short film with my older brothers' cub scout troop. We had an unfinished wall in the basement that he drew a cemetery scene on and he directed the boys to walk warily into the "graveyard" where a member of the troop was waiting to pop up wearing a mask to scare them. The old 8mm film had no sound, so the boys had to be very melodramatic. It was a hoot! I remember a cardboard box robot costume with blinking Christmas light that Dad made for my brother, Mike. Dad always collaborated with Mom for any sewn bits of costumes. Mom was a patient and talented soul, herself. We always had way more fun than a person should have at Halloween! If you love Halloween as much as I do, you'll want to check out the blogs I follow! RABAC - Robots and Bloggers of the World Unite!